More than six months after Typhoon Haiyan devastated large parts of the central Philippines, progress is being made in rebuilding livelihoods. However, huge challenges remain in making them sustainable. “What we need now is to intensify emergency employment efforts on the ground and transition into sustainable livelihood programmes,” Ruth Honculada-Georget, early recovery and livelihood co-coordinator for the International Labour Organization (ILO) in Manila, told IRIN, describing their work ahead as “enormous”. According to a May report by the Geneva-based Internal Displacement and Monitoring Centre, progress on sustainable solutions for survivors remains key to the recovery and resilience of those affected by the Category 5 storm which slammed into the region on 8 November 2013 displacing more than 4 million people and leaving over 6,000 dead. Of the 14 million affected, 5.9 million workers lost their sources of income and livelihoods, of which 60 percent were men and 40 percent were women, the Early Recovery and Livelihoods Cluster (ER&L – made up of more than 50 international and local NGOs and co-led by the government, ILO, and the UN Development Programme) reported on 14 May. More than 2.6 million of those affected were already living below the poverty line or were in vulnerable forms of employment before the typhoon, including the agriculture, fishing and forestry sectors, or a combination of all three. Wind and powerful storm surges destroyed or damaged key assets and disrupted livelihood activities resulting in income losses of up to 70 percent across the region, the Multi-Cluster/ Sector Rapid Assessment (MIRA II), a cooperative effort involving more than 40 agencies working in the nine affected regions, revealed. The agriculture and fishing sectors were severely affected, with the main impacts on agricultural activities related to the loss of rice, coconut trees and other standing crops, authorities say. Many residents lost the tools of their trade, including farming tools, fishing boats and nets, with very few survivors having the skills to engage in alternative livelihoods during displacement. Six months on, more than 100,000 people have been provided with short-term employment, livelihood support and services, including skills training and micro-enterprise support. However, the real needs go far beyond that. “Farmers and fishermen and women urgently need support for the next phase of recovery,” Leo Roozendaal, Oxfam’s Asia deputy regional director, said. “In-kind food aid will pull out and by then people will need to have restored their livelihood or found alternative livelihoods sources to be able to take over afterwards,” a report by Terre des Hommes (TDH) warned, noting “livelihood needs are largely uncovered”. According to the UN Food and Agriculture Organization (FAO), the typhoon struck between two planting seasons (April to June and October to December), destroying 600,000 hectares of farmland and washing away rice that had just been harvested or had just been planted, resulting in an estimated 1 million tons of crops lost, amounting to US$213M in agricultural losses. “Through collaborated efforts with the government, we were able to meet the December to January  rice planting season,” said Rajendra Aryal, senior emergency and rehabilitation coordinator for FAO. Around 44,000 families in areas identified by the government were given sufficient rice seed to plant one hectare, in time for the December/January planting season, enough to support a family of five for over a year. “The expected June harvest will be enough to guarantee a farmer’s food security for a year and will hopefully have a little bit left for selling,” said Aryal. By June, this will yield enough rice to feed some 800,000 people for a year, at an estimated market value of $84 million, the agency reported. Also badly shaken was the region’s fishing sector, which employs close to 150,000 people, with roughly 30,000 fishing boats lost or damaged, according to the Bureau of Fisheries and Aquatic Resources (BFAR). 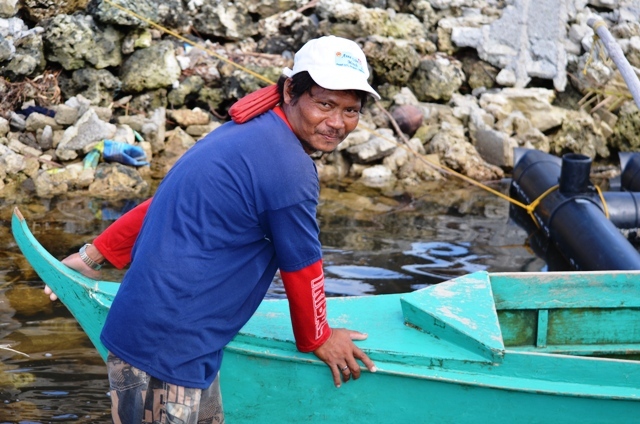 “At the start, we prioritized boat repair and boat-making so the people could fish and at least have food to sustain themselves,” said Asis Perez, BFAR national director. But even with these improvements, fishermen say the catches are slim. “The fishermen tell us that the debris swept away by the storm surge has settled at the bottom of the sea, onto the reefs and corals which are the breeding grounds of the fish,” Maria Madamba-Nunez, media, advocacy and campaigns manager for Oxfam, explained. On average, the daily income from fishing activities ranges from $7 to $13 per day, depending on the weather, seasonality and the time, the TDH report said. And while there are ongoing efforts to rehabilitate other areas of the fisheries sector such as seaweed farming and aquaculture, BFAR conceded that these were small steps in the bigger scheme of things. “I wish we could say that we are moving into diversifying livelihoods [for sustainability], but right now, we really need to fix the basics first,” Perez said. Typhoon Haiyan struck a particularly devastating blow to the country’s vitally important coconut sector, with many saying it will take a decade for the industry to recover. The Philippines is one the largest coconut producers in the world, accounting for 26.6 percent of global production. At the same time, its devastation created knock-on effects along the entire value chain, affecting people who were engaged both directly and indirectly - from farm owners, workers and traders to those involved in transport and logistics, according to FAO. 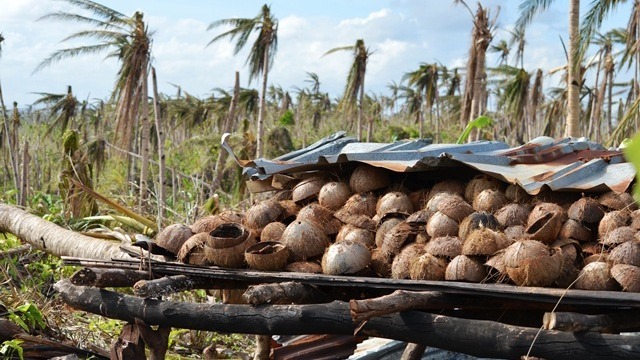 An estimated 33 million coconut trees were damaged or lost in the storm, affecting around one million farmers, the Philippine Coconut Authority reported, with losses to the sector estimated at close to $400 million. “Many of the coconut farmers were dependent on coconut farming alone. We need to teach them alternative skills and intercropping with crops with quick gestation given that it will take between six to eight years for a coconut tree to grow again,” Oxfam’s Madamba-Nunez said. At the same time, clearing the trees to make space for re-planting also remains a challenge. Already, there are reports of beetle infestation, which will render the fallen trees unusable for recycling into coco lumber. The government has committed to clear 390,000 trees within the next 90 days. However, this is only a small percentage of all the fallen trees that need to be removed. “Farmers are in crisis. Food distributions have stopped, cash support is slowing down, and yet coconut farmers have no way of earning money to support their families,” said Maria Mendoza, executive director of Fair Trade Alliance, who alongside Oxfam and others is calling on the government to step up its clearing activities. “The more we delay in clearing the farms, the more time it will take to plant quick-growing crops and secure immediate food and income,” she said. Under the Philippines $788 million Typhoon Haiyan Strategic Response Plan, of the $117 million required for early recovery and livelihood activities, just 27 percent has been received thus far, leaving a gap of some $85 million as of 28 May.